The Hydra is found basically any body of freshwater in the world. You can find them in freshwater bodies of water like even your local pond, lake or river! They are just rare to find in stores. Generally somewhat passive, but will eat fish eggs and fish fry. For its small size, avoid fish large enough to eat this invertebrate. Fish like Blue Gouramis will eat Hydra. Hydras have stinger-tentacles called nematocysts, which most cnidarians have. The nematocysts have stinging cells called cnidocytes which can even kill humans. But hydras' nematocysts generally are harmless to larger animals. 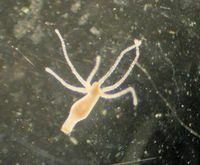 Hydras use nematocysts to hunt. The Hydra is generally considered a carnivore but will steal food from other animals, like pellets and flakes. The Hydras really don't mind their environments, but generally will tolerate SOME brackish, barely 0.5% salinity. Though it's best to provide hydras with some hiding spots or basically mini-fish forests. Because hydras can hide from larger animals that will eat them. Generally peaceful, but will eat fish fry and fish eggs. Hydras look similar to their relatives, the Jellyfish and the Portugese man-o-war, except their body is slimmer and more rounded similar to the shape of a sausage, and their 7 nematocysts are thicker and shorter and pack a less deadly sting. Remember they are also WAY, WAY, smaller than their relatives.